If you were still here, we’d certainly have plans today. 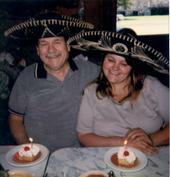 You’d be 82 now, so I would drive to you and we’d probably eat Mexican food. And you would make jokes about your health and I’d laugh while secretly hoping things aren’t getting too serious in that department. You’d listen to me ramble on about the kids and when I listed my failures and insecurities, you’d point out my strengths and successes. The day would go by way too fast and I would choke back the tears when it came time to drive away, if you were here today. Some people remember you on Father’s day because you were an amazing Dad and grandpa. Others remember you during the holidays because of the soothing way you always read the Christmas story from the Bible. Some people love to think of you at Halloween because of the amazing haunted house you used to create. But me, I think of you on April the 9th. I wasn’t supposed to be born until May, but I know exactly WHY God brought me early. I was meant to be born on your birthday. And we shared 27 wonderful birthdays before you went on… But if I’m being honest, you didn’t go away. You’re still here. And I still think of you all the time. And even though I can’t reach out and touch you, I can feel you all around. I’m so torn between the laughter and the tears, but I know you’d challenge me to laugh. So maybe I’ll have a sopapilla in the name of Birthday Buddies and I’ll tell myself what you would say if you were sitting there across from me today. Happy birthday Softy. Our day is the one gift I’ll hold forever. You’ve been gone for 13 years now… and I still think of you every single day. But especially on our day. On our day, I sing the Beatles and miss you like crazy. I’m afraid I don’t sing it quite the same way, but hey, I sing it to you! Most years I cry. But the tears aren’t as awful as they used to be. The hole is still deep in my heart, but I’ve learned to smile when I miss you. I wish I had more pictures of us together. I wish I had more pictures of you. There are never enough memories when you cross my mind. Last year was probably the worst year of my life. I hope nothing ever tops it. I was scared most days. I thought any moment everything was going to implode. I worried about my daughters. I worried about my sons. I worried about my marriage. And I worried about the strain our troubles were taking on the entire family. I could feel the sorrow every time I talked with my mom or my dad and it just made my heart ache. So many times I thought about you. I just know you would of had the perfect words of wisdom to get me through the rock bottom of my existence. There were days when I tried to channel your voice and give myself a pep talk. The other night I had this dream. You will still here. My step-dad too. And I was talking to both of you. And I was listening to you tell me you’d been here each day. You were telling me all about the things I’d been through, just to prove you were never far away. I woke up feeling your presence. In fact, I was calling your name out loud. Sometimes I get those dreams and I see you and I don’t even want to get out of bed because I don’t want to lose that moment. But I have to get up. These kids will knock the walls down if I’m not watching carefully. You know 40 started off rough, but it sure did turn around. I’m finally finishing college. I know, it took me a few decades. That’s ok. The more amazing thing is that I’m a writer. A real bonafide cash-the-check writer! And my kids are doing amazing things. Blondie got married and her dreams are slowly coming true. My Dyl Pickle is graduating. And the rest of the crew is moving right along. Tucker is going to high school. I always wish you had seen him just once. I still think of you in the hospital that last night I saw you. You said “wee Willy Tucker, that silly little f—–fellow.” He was born 41 days after you passed on. I’m not sure how my dad came up with the exact same sentence, but he did. Isn’t that ironic? Trenton is headed to Junior High which will make the twins the rulers of intermediate school- big fifth graders! And KK is only one step behind, but you know all this, because you’re still here. I know you’re here. When I feel like breaking down, I say to myself “Girl get yourself together. Softy is gonna see you fall apart” and that’s how I pick myself up when the days are overwhelming. 41 is going to be amazing, I just know it is. Whether I’m conquering the world wide web or tucking my grandbaby into bed, I know you’re part of me and I never let that go. And now when I think of our birthday, I smile more than I cry. You were the greatest gift the good Lord ever gave me. Grandfathers have a way of making the world magical, and you did exactly that. So Happy Birthday Softy. I still miss you, but today I’m gonna try not to cry, because it’s my birthday too! It’s been quite a week here in the zoo! Partly because today is my birthday, and I’ve been celebrating all week long. I often get the birthday blues because I shared my birthday with my grandfather for 27 years. Losing him still stings like a swarm of bees straight to the heart. Do you know what makes everything more fun? Candy! It’s true. Think about it. Would your kids get all dressed up and knock on all the neighbor’s door if there wasn’t candy involved? Probably not. Of course the gobs of Halloween candy are long gone by the time December 1st rolls around. That’s when we start our chocolate countdown to the big day! The other day was my birthday…. and I’ll tell you, I’m officially 38 years old! I hear a lady doesn’t tell her age, but I’m proud to be this old. When I turn 40, there will be no black balloons, no tombstones, no sad faces… Sure, I’d love to go back to the 15 year old figure I once sported that lacked gray hair or fine lines, but where’s the character in that? I earned every single one of these gray hairs, including the three I plucked out last week. Getting older doesn’t bother me, but another year without my birthday buddy, that makes me sad. This year, instead of the flood of tears, I tried to hear his jokes in everything I said or did. It kind of helped. OK, there were still some tears. I believe some people touch our lives so deeply and there is no real recovery from that loss. The hole never heals, you just learn to function with a gaping wound in your heart. My grandfather was that man. Who’s Gonna Fill His Shoes? Join Music Mondays and share your favorite memories! Sometimes our favorites memories of childhood aren’t the big aha Disneyland moments. Sometimes, they’re the simpler, everyday routines we cherished. When I was a kid I loved the smell of cigars in my father’s den, or the smell of leaded gasoline being pumped in our car! I know, I’m weird. My grandpa always promised that he would visit me in my dreams when he died, so I can’t help but think every time I dream of him that he’s here for a little visit. I find it strangely comforting. It doesn’t happen as often as I wish it would, but the other morning I was feeling bad and after I took the kids to school I laid back down in my bed and pulled my down comforter up over my head. Before long, he was standing there.